Lovely, quiet home with lots of natural light in a wooded setting with plenty of privacy while just around the corner from all the action. Moments (not minutes) from popular attractions that people from throughout Fairfield County enjoy including the Rowayton Pizza Parlor, Brendan's 101 Cafe/Ice Cream Parlor, the famous Sea Food Restaurant and Fish Store right on Five Mile River. This residence is beautifully maintained and pristine clean. Updated eat-in kitchen with gas stove. Great outdoor deck as well as a wrap-around flagstone terrace for grilling/eating/reading/entertaining. Beautiful flowers dot the glacial rocks overlooking terrace. Short walk to Rowayton Market, Rowayton Arts Center and Pinkney Park in downtown village. Nature Preserve, Library and Bailey Beach also nearby. During summer enjoy the Summer Arts Music Festival every Sunday. Feel free to inquire about dates not currently listed. My name is Joan McGee and I grew up in Stamford CT. I have lived in Rowayton for 45 years and I am the mother of Brendan of Brendan's 101, a favorite spot for Rowaytonites to meet and eat. I am a retired educator and am enjoying spending time with my three grandsons. I love to travel and enjoy sharing my home with others. My close friend, Susan Mansfield, manages her two homes on HomeAway/VRBO and has added mine to her repertoire. 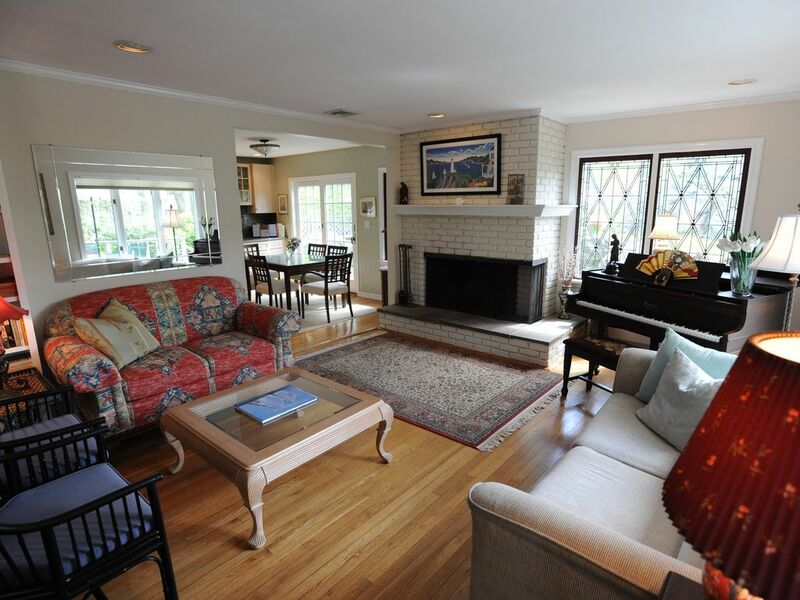 It is a sweet home in an ideal location near the village of Rowayton which is very desirable. People who have stayed in my home always love it and want to come back; many have even offered to buy it! Close to everything Rowayton has to offer. New gas stove. Fully equipped for people who like to cook. Maintained by owner. Beautiful rock cliff and wooded area overlooking deck and patio. Can rent at Down Under below Rowayton Market to kayak up and down Five Mile River and Long Island Sound. Tables with umbrella and six chairs on both deck and flagstone patio. Joan and Susan took care of every detail. My 32 days as a Guest, Complete Bliss, I am still awestruck; from the time that I arrived, enjoying every step throughout the daily journey I took enjoying this beautifully quaint Rowayton home. The moment I arrived I knew this place was magical right out of a story book. As each day arrived, I remember saying to myself it cannot get better than this. Super comfortable beds, soft linens, kitchen stocked with what’s needed in utensils and appliances. New England Sound Water Front within 200 feet of the front door, walk to market, post office, restaurants, great small-town atmosphere. We thoroughly enjoyed our trip to Rowayton and our stay at this house. Equipped with just about everything you need, this is a very comfortable house and perfect for relaxing. Susan was wonderful! Very helpful and very communicative before and during our stay! She was very easy to deal with, and the house was great! Really nice outside area with a grill made it the perfect place to relax after a long day. We had a great stay at Joan's house. Rowayton is very walkable. The house is just a few blocks from main street, a few more to the park with Shakespeare on the Sound, and less than half a mile to the beach. Owner very responsive to needs and arranged beach passes for us before we arrived. My family and I enjoyed every minute of our stay in this lovely home in Rowayton, CT over Christmas, 2017. Every comfort was provided, the house was sparkling clean, and the kitchen was so well equipped that it even had a coffee grinder, French press and a food processor! The layout of the house allowed people to spread out between the living room and tv area. I also appreciated the quick response of the property manager to questions I had about the house in advance; it made packing so much easier. I hope this house will be available to us in the future.